The Battle of the Books is a statewide Alaskan reading motivation and comprehension program sponsored by the Alaska Association of School Librarians. The goals of the program are to encourage and recognize students who enjoy reading, broaden reading interests, increase reading comprehension and promote academic excellence. Lists of books are chosen and questions are written for all grade levels. Students read the books, discuss them, quiz each other on the contents, and then compete in teams of not more than three students to correctly answer questions based on the books in a "quiz show" format. Questions begin with the words "In which book...." so that the answer will always be a title and author. Teams may participate at the school, district and state levels of competition. Recommended titles for each level are compiled each year by a committee of librarians and teachers and are based on specific program criteria. An attempt is made to vary the titles chosen according to genre and difficulty so that readers may encounter a broad range of books. At the annual Alaska Library Association conference, the tentative booklist is created and school librarians choose books from the list for which they will read and write questions. The booklists are finalized in August and become the official lists at that time. Participating schools and public libraries purchase the books for students to borrow and read. 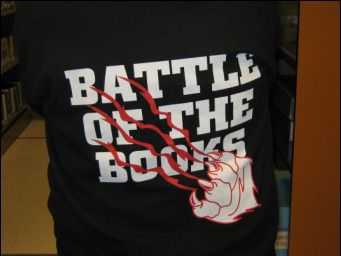 Email Ms. Reyes if you are interested in participating the JDHS Battle of the Books Program!